The ix35 Fuel Cell cars were handed over by Hyundai Motor Europe, and are the first hydrogen-powered vehicles manufactured on a production line to be introduced in Europe. The only tailpipe emissions are water vapour, so its use will help Copenhagen achieve its aim of becoming carbon-neutral by 2025. Since 2011, Hyundai has deployed prototypes of its third-generation ix35 Fuel Cell in a wide range of initiatives to raise awareness of hydrogen’s benefits as an automotive fuel. It also supports the drive to establish a pan-European refuelling infrastructure, and to demonstrate the cars’ real-world practicality to public and private organisations. For example, EU policy-makers have access to ix35 Fuel Cell vehicles – via the European Fuel Cells and Hydrogen Joint Undertaking (FCH JU) in Brussels – to see for themselves the market-readiness of Hyundai’s FCEV technology. And earlier this year, senior representatives from 100 European businesses learned about and tested the ix35 Fuel Cell at a Hyundai Motor event in Berlin. Hyundai is also participating in the US Department of Energy’s newly launched H2USA partnership, focused on advancing hydrogen infrastructure to support more transportation energy options for US consumers, including FCEVs. The new hydrogen refuelling station from H2 Logic is based on the company’s H2Station® CAR-100 product, and was installed in only 48 hours. The CAR-100 has been developed to enable the swift and cost-effective deployment of an initial network of refuelling stations, to support automakers’ efforts towards FCEV market introduction. At full utilisation the CAR-100 is capable of providing hydrogen for almost 200 vehicles. As fuel sales grow the CAR-100 can easily be replaced by a larger station, and relocated to the outskirts of the network. All production and refuelling equipment is integrated into a compact station module, allowing for easy transport and installation in as little as 48 hours. This significantly reduces both the investment cost and time from contract to start of operation, which is important when deploying station networks. The Copenhagen hydrogen refuelling station and fuel cell electric vehicles are part of the HyTEC demonstration project, which is supported by the European FCH-JU and Danish EUDP programmes. 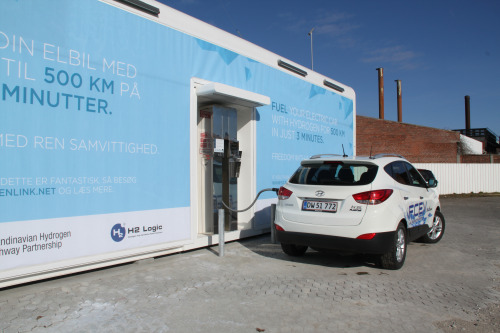 Last summer H2 Logic supplied a hydrogen refuelling station for Lillestrøm in Norway, as it builds up a network of hydrogen stations across Scandinavia.